Ok, so the above picture is just a silly little thing I threw together because I needed a graphic for this post. Acupuncture has nothing to do with poison or skulls or crossbones, but the app I used had a limited pool of drawings and I didn't want to get too wrapped up in finding the perfect Rod of Asclepius. 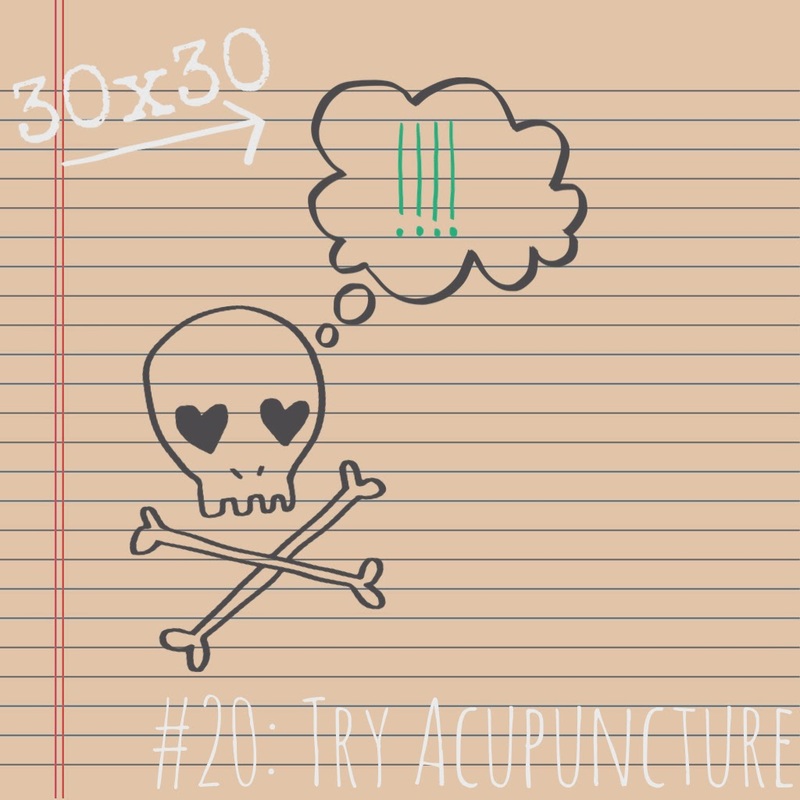 Anyway, so today I completed 30x30 Challenge #20 - I went to an acupuncturist and subjected myself to 20 minutes of lying facedown with a dozen or so needles sticking out of my back and legs (hence why I couldn't get a picture of said activity). Why would I do such a thing, you ask? Well, I've always been curious about the "softer" medicines and Eastern healing techniques. I'm in no way an objector to modern medicine and science, but I do think that there are definite benefits to yoga, tai chi, massages, positive thinking...the list goes on and on. I have spent most of my adult life dealing with a problem neck/back/shoulders and basically my whole life living with migraines and headaches, and my patience is running out. So I figured it was high time to see what an acupuncturist would have to say. The session began with a quick lesson in proper standing and lifting techniques. Since my job routinely requires me to lift/crawl/move in mysterious ways, it's entirely possible that my back problems are related to how I move throughout the day. Then we moved to the actual needling, which was nowhere near as scary as I had thought it would be. I laid facedown on a masseuse table, he inserted the needles, turned on some classical music, and then left me there to rest underneath a heat lamp for 20 minutes. I felt nothing (other than the soothing warmth of the lamp), and rather enjoyed my brief nap. All too soon I was woken up and told to get redressed and come into the waiting room. We then had a brief chat about how I was feeling (perfectly fine) and about my diet - which is apparently not perfectly fine. I was told that eating foods containing high levels of sulfides is a major cause of headaches, and that dried fruit, red wine, and cheese have the highest levels of sulfides among most commonly eaten foods. I won't say which, but two out of three of those aforementioned foods make up like 90% of my diet. I haven't yet decided how far I'm going to go with his suggestion (slightly, greatly, or completely cutting out sulfides), because I frankly don't know how much it's worth. Yes, being headache free would be fantastic, but if it means that I can never have a slice of pizza or grab a piece of cheese from the snack tray...that just doesn't sound like a very enjoyable lifestyle for me. Case in point - just hours after I was told to cut cheese and red wine out of my diet, I decided to roast some Brussels sprouts for a quick snack - but it was only after I had started chopping the sprouts that I realized my recipe contained both cheese (a sprinkle of parmesan) and red wine (drizzled over the top with some salt, pepper, and balsamic vinegar - delicious, if I do say so myself). Clearly, this isn't going to be a quick adjustment. While the majority of my 30x30 challenges have been more New York Bucket List-type activities, I do acknowledge the benefit in choosing experiences that help further my education and prepare me for the next 30 years. If that means being more responsible in the foods I chose to eat, than maybe that's just what 30 is all about.